American football couldn’t be more interesting than it has become over the years with iconic and phenomenal draftees making their entries into the league yearly. It becomes a dream come true for players when they are eventually selected by one of the professional teams, coming out of college or free agency, to play in the NFL. Solomon Thomas, who spent his younger days playing soccer and enrolled in Irish step dancing after school, couldn’t be happier when he heard his name announced as the third overall pick in the 2017 NFL Draft. The San Francisco 49ers scooped up the defensive end (DE) in the first round. Prior to his NFL dreams coming true, he had an exceptional career at Stanford University. However, beyond prepping for the NFL Combine and surviving his rookie year, Thomas endured the most challenging situation in his life. Find out what in this article lined up with beyond the field details about the Niners DE. The defensive lineman was born Solomon Christopher Thomas on December 20, 1995, in Chicago, Illinois. His father was an international sales manager for Proctor & Gamble and was stationed in Australia. Consequently, the family moved to Sydney, Australia when Thomas was 2 and he spent most of his childhood there. After five years of their sojourn, they returned to the USA and spent a few years living in Connecticut where Thomas was introduced to football just before moving to the football-crazed state of Texas. He played explosively in high school at Coppell, Texas. At Coppell High, he recorded 89 tackles with 8.5 sacks in his junior year and as a senior, he roped in 78 tackles, 12.5 sacks and 26 tackles for a loss. Subsequently, he was rated as a four-star recruit and was ranked among the top players in his class of 2014 among whom are Myles Garrett, Leonard Fournette, and Joe Mixon. Being a standout player, Thomas received a ton of offers from virtually all the top universities in the nation including Alabama, Clemson, Ohio State, Texas, Texas A&M, UCLA, Arkansas, Standford but eventually enrolled in the latter where he committed to play college football as a defensive end with the Cardinals. As a freshman, he didn’t see action on the field but took full advantage of the season to develop his body and study films to step up his game. He was also a sponge around veteran standouts, soaking in every lesson he could. Going into his sophomore season in 2015, he became a defensive force for the Cardinals. He played in all 14 games (6 starts) and recorded 39 tackles, 10.5 tackles for loss, 3.5 sacks and two fumbles recoveries. Despite the success recorded in 2015, the 2016 season became even more explosive. Therein, he displayed quickness in getting into the backfield. Solomon Thomas started all 13 games and had 62 total tackles with 15.0 tackles for loss and 8.0 sacks. In turn, he was selected to All-Pac-12 first team and was the winner of the Morris Trophy as the best defensive linemen. After his junior season, he entered the 2017 NFL Draft and was selected in the first round (3rd overall) by the San Francisco 49ers. Following his selection, he inked a fully guaranteed four-year, $28.14 million deal, including a signing bonus of $18.61 million with the Niners. Thomas was born into an athletic family helmed by Chris who was an international sales manager and Martha Thomas, a middle school teacher who also coaches volleyball, basketball, and track. The duo were also athletes at College of Wooster. While Chris dunked the ball, Martha blazed the trail on the tracks. There’s also an uncle, Jon Thomas who was a speedster; he ran track at Indiana University where he was a four-time Big Ten 400m hurdles champion. Solomon is one of two children born to his parents alongside an elder sister, Ella Elizabeth Thomas who was his best friend. Ella was an alumnus of the University of Arkansas. As a sophomore, she was a victim of sexual assault whose fallout included depression, PTSD and anxiety. 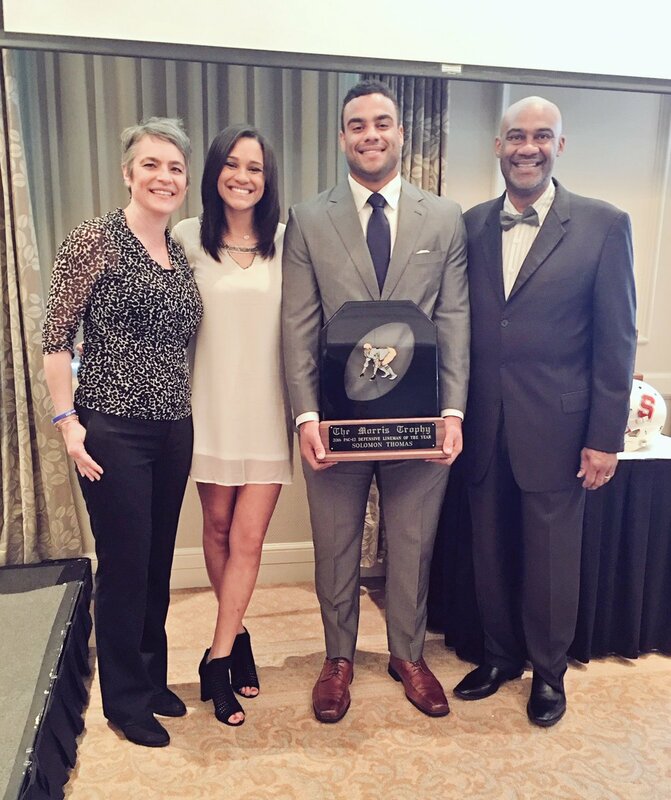 Beyond preparing for the NFL Combine and surviving his rookie year, Solomon Thomas endured the most challenging situation in his life, losing his only sibling who he shared a dream of opening a restaurant with. However, before the dream could ever become a reality, Ella died of a self-inflicted gunshot wound in January 2018; an unfortunate case of suicide. While the incident was a hard blow to the family, they decided their daughter and sister would not just be a statistic among the 121 Americans, based on the average, who commit suicide daily. Instead, they made mental health recognition their cause, using their grief as an outlet to let others know about mental health, suicide prevention as well as the therapeutic effect of speaking out, as a way to have some good come out from their tragedy. Thus, on June 2, 2018, they participated in the 16-mile nighttime Out of the Darkness Walk in Dallas to raise funds for the American Foundation for Suicide Prevention. What an epic way to mourn the loss of one so deeply loved; perhaps it will lead many suffering silently into the light, where their lives can be saved. Solomon was not projected to be a top 5 pick for naught. He is an excellent pass rusher and possesses all the physical attributes that make for greatness in the league. Besides his rare athleticism which combines his athletic ability, intelligence, speed, and technique, he also makes play with his hands and is one of those players who doesn’t stay blocked. At a height of 6 ft 3 inches (1.91 m) and 280 lb (127 kg), he is probably on the strong side of athletes. His arm length measures 33 inches (0.84 m) while his hand size is 9 7⁄8 inches (0.25 m).